Having been born a few years after the end of WWII, I remember hearing all the war stories my dad used to tell. He served in the navy and was a cook in the Philippines. I am very connected to veterans. My husband spent his career in the Army, my son was in the Coast Guard, and my nephew had 2 tours of duty in Iraq. Veterans Day is a special holiday to me not only for the veterans in my family but for all the families who have sacrificed so much and for those who are in harms way today. I have put together lots of free resources and activities for my wonderful followers and viewers and hope you will find some great lessons, poems, crafts, and activities for your classrooms. I found a list of books for Shared Reading or for your students to read at Amazon.com. I have been to "The Wall" several time as there are names of soldiers that my husband has known on it. Just click on the picture below to see a complete list of books. Teachers Planet has a complete list of all the Veterans Day Websites for lessons, activities, and information that you can link to. You may want to start with this website first. Just click on the picture below. Looking for some wonderful poems for Veterans Day? I have a few great websites. Do you know why people wear poppies on Veterans Day? It was the first flower that grew in Europe after the World War I. Here is the famous "In Flanders Fields" poem that you can access by clicking on the picture below. You can find other wonderful poems like the one below at applesfortheteacher as well as other free resources by clicking on the picture below. Are you are looking for some great craft ideas like the one below? Just click on the picture to see lots of fun crafts to make with your students. Finally if you are looking for lessons plans you may want to check out the ones at Education World by clicking HERE. I just revised and updated my "Honoring Veterans on Veterans Day" packet for Grades 2-3 that you can check out by clicking on any of the picture below. 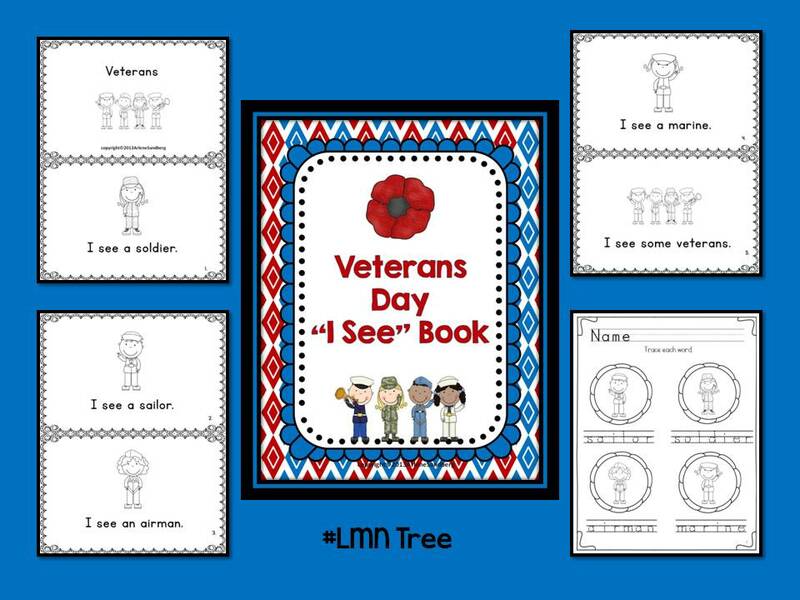 Students will learn about the history of Veterans Day and important facts through reading and writing activities.You will find a Shared Reading Book and 2 differentiate Reading Texts and Comprehension Questions and Picture/Word or Fact Cards Match. Students will engage in Informative Text and Opinion Piece Writing Activities, Noun Sort, Letter Writing Activity, and an Acrostic Poem Writing Activity. You can check out this packet by clicking on the image below. When you download the Preview you will see sample pages of all the Reading Texts as well as many of the writing and other activities in this unit. I also have a free Veterans Day Syllable Sort Packet at my TpT store which you can download by clicking on the picture below. Would truly appreciate some feedback. I decided to put together a K-1 Veterans Day packet called "Veterans Are Special People." It introduces who veterans are in a very simple way and that veterans are brave and are heroes. It includes a Shared Reading Book, 3 Differentiated Guided Reading Books, "My Veterans Day" Writing book at 3 different levels as well as writing and literacy activities. There is a fun "Design You Own Special Nametag" to display on your bulletin board. Students will write their names and draw pictures of things they love or that make them special. You can check out all the activities and materials by downloading the Preview file. You will see sample pages of all the Emergent Reading Books, Writing and other activities in this packet. Just click on the picture below. And last but not least a freebie for my K-1 followers and viewers. 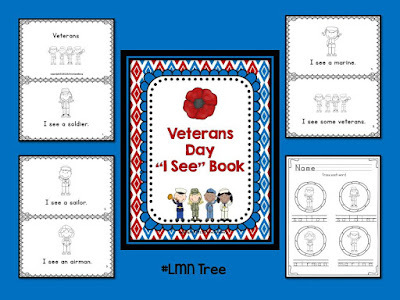 You can download your free Mini Make and Take Veterans Day "I See" Book by clicking on the picture below. I have lots of new Pinterest boards for you to follow. Just click HERE. I hope you find some wonderful resources and activities to use for Veterans Day. Thanks so much for making a difference for your students. What activities do you do for Veterans day? What a great collection of resources for Veterans Day. Every time I read The Wall, I get choked up, but I read it anyway. It definitely leaves an impression on the children. A very nice selection for Veteran's. I pinned this to my Pinterest Board. Good Job. These are great ideas. Nice posts about Veterans. I have also pinned this to my Pinterest Board. Good job Arlene. Nice job, Arlene, and for such a significant holiday that can easily get bypassed in the Halloween-to-Thanksgiving rush! By the way, my dad was also in the Navy in the Pacific during WWII. Many thanks, Arlene! My father was in Normandy during the war...Veteran's Day studies are always in need and these are NICE!! I was looking for such wonderful veterans day poems 2015, Yes you have great website. for poems and pictures, It is helpful to pre plan veterans day event.